This simple one pan skillet dish comes together quickly for a simple weeknight dinner! 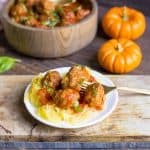 The sauce tastes absolutely incredible making this a great meal to serve to guests. Paleo and Whole30 approved! 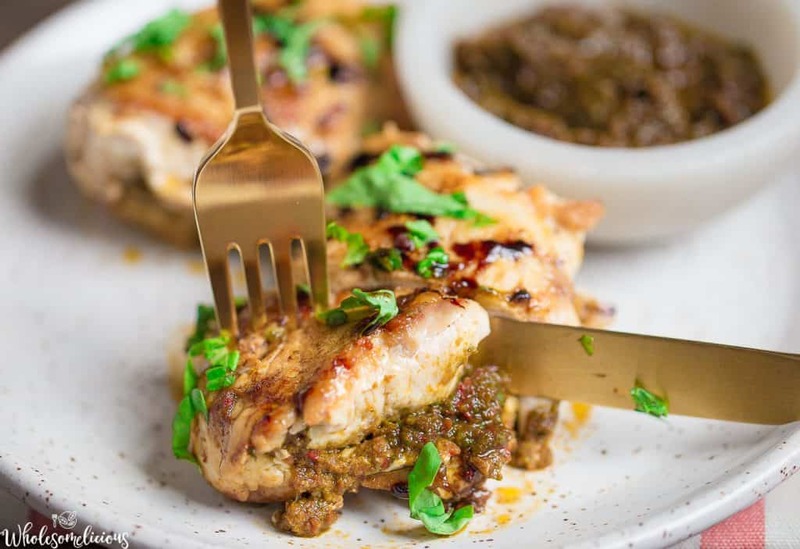 Oh hello one pan skillet chicken breast stuffed with the most delicious blended sun-dried tomato and basil sauce. 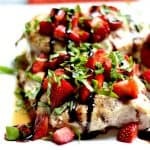 I’m just going to serve you up with a balsamic garlic sauce for an easy weeknight healthy meal! Nailed it you guys!! As you would guess if you are a regular reader of my blog, I absolutely love cooked chicken breast. Wrong. That is actually a false statement. 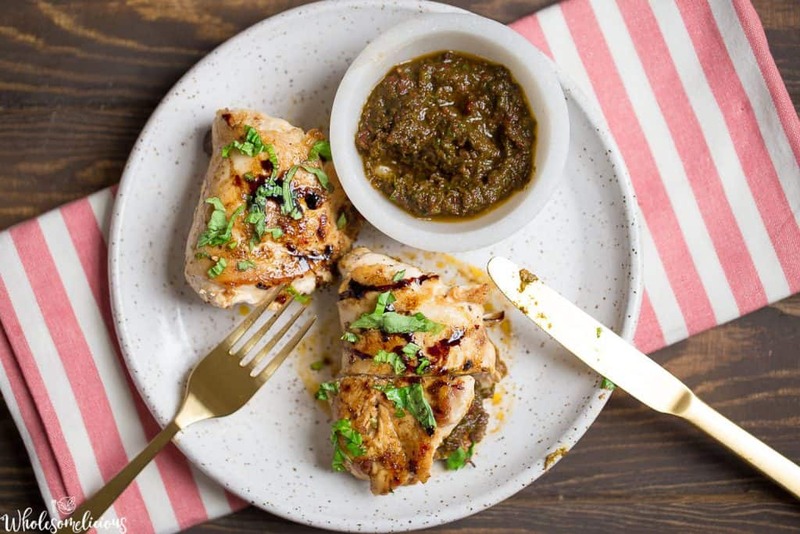 My most favorite way to enjoy chicken is grilled, and unless it’s in a soup or hiding behind a ton of sauce and fixins, I would just rather not eat it. But I finally discovered my IT chicken dish that is full of flavor, cooked perfectly with a browned balsamic garlic sauce, and served over whatever your heart desires. Because once you cook this chicken perfectly, it won’t matter what you serve it with. I used a cast iron skillet to brown the chicken on both sides, and then had to transfer to the oven to make the ensure the chicken is cooked all the way. 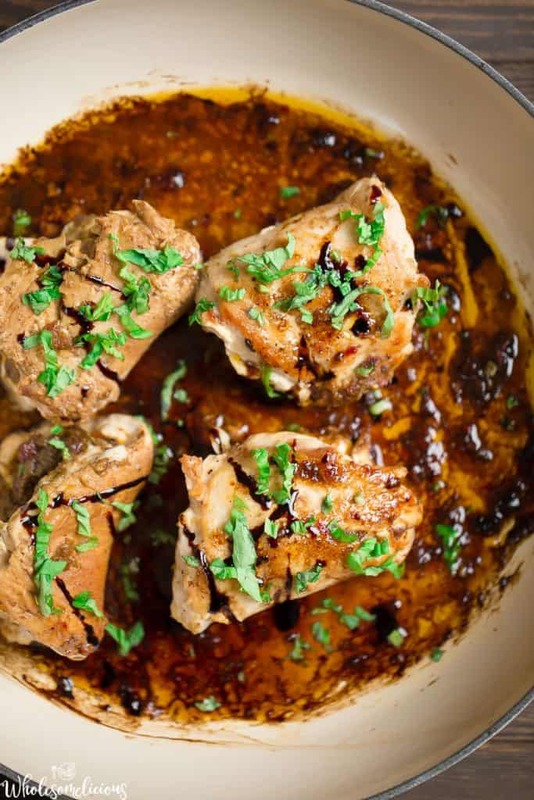 This created a bubbly balsamic garlic sauce. You can be like me, and just want to spoon the sauce in your mouth. Or just drown the chicken. Scraped up bits of the sun-dried tomato garlicky brown bits and basil, and then just for good measure I added some balsamic. Get a spoon, grab some bread, and sop it all up!! I’m getting off track again. Stay on topic, Amy. Don’t get ahead of yourself, Amy. 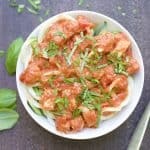 Before you even start the chicken, you’ll need to make this sun dried tomato basil “paste” to stuff your chicken. Think of it like a pesto, but without the parmesan. And by all means, add parmesan if your belly desires. My belly doesn’t love parmesan. You’ll thank me for the leftover paste. You can spread more of it on the chicken, or use it as a sauce for pasta. 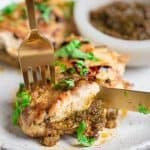 I served pasta for my kids with this chicken, and they requested it again in their lunchbox the next day. 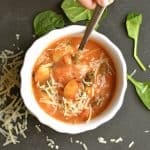 If you want to do a Paleo pasta version, use with spaghetti squash or zoodles. Talk about delicious-ness. I served with a little balsamic cream here, too. Maybe getting carried away, and definitely not necessary. Prepare your chicken breast by pounding the meat thin (approximately 1/2 inch in thickness). Set aside. 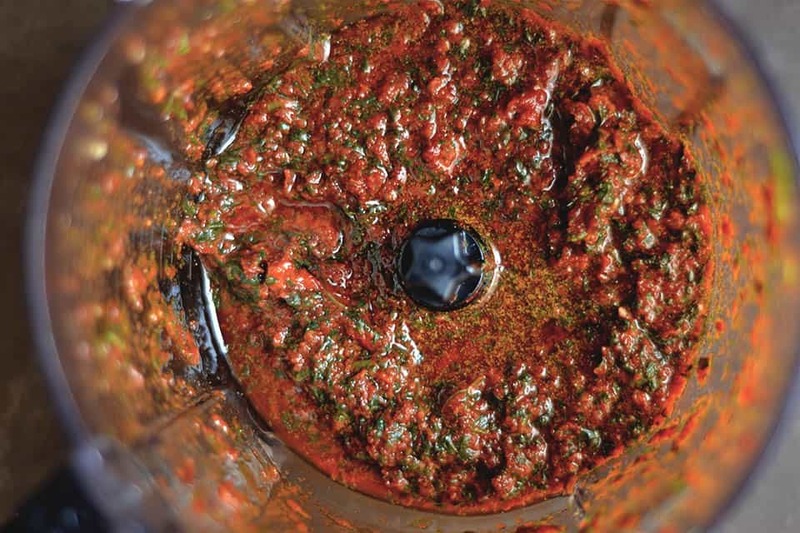 Make your sun-dried tomato and basil sauce. Add basil, tomatoes with oil, salt, and 1 clove of minced garlic to your food processor and begin to pulse. While motor is running, slowly add in 2 tbsp olive or avocado oil. Paste should be thick, if too thick, add in another tbsp. Continue to pulse until well combined. Spoon 1 tbsp of the sun-dried tomato/basil paste on to each chicken breast, spread with a spoon. You will have extra paste, use to serve. Fold each chicken breast in half with paste in the middle. Salt and pepper. Heat a cast iron skillet to medium high heat. Once heated, add in another 2 tbsp olive oil, and minced garlic. Saute for 1 minute. Now add in your chicken. You can secure the folded chicken with a toothpick to prevent it from opening. Cook on each side for 2-3 minutes, or until crispy brown. Add in chicken broth, and balsamic vinegar. Scrape up all the leftover bits on the bottom of the pan. Combine arrowroot starch with a few tsp of water to thicken and pour into the sauce to thicken. Place the skillet in the oven for another 5-7 minutes, or until chicken is completely cooked. Remove from the oven and serve immediately spooning the sauce over your chicken.